Contents: Chocolate milk, baked beans, fruit, ketchup, french fries, a corn dog and coleslaw. Here in Japan they call corndogs 'American Dogs'. I explained to my students that we call it a 'corndog' in America. Their sheltered little heads exploded. 'The bread part is made of corn,' I answered. I got blank stares in return. I`m sure they thought I was lying. That's a funny story. You should make them cornbread. It is a slightly sweet bread, made from corn meal, that is very popular in the US, particularly in the South. It goes great with honey, and butter. I know what cornbread is. ^_~ I may live in Japan but I was born and raised in the American. My mom`s holiday cornbread stuffing is one of the only things that really makes me homesick. I meant to say `in the American country side.`` Dunno how that happened. I kan too speaks good za engrishes. 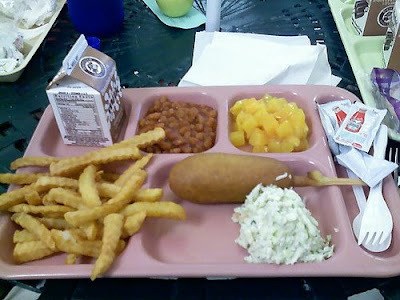 We feed our kids the worst meals imaginable in the US public school system. Look at that?! You'd never order that at a restaurant or make it at home. Who comes up with this? !